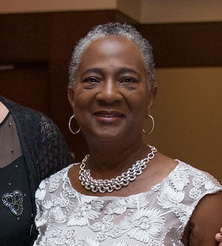 Dr. Jamesetta Alexander Newland ’72 was inducted as a Fellow of the American Academy of Nursing in October at the Marriott Marquis in Washington, DC. This is one of the highest honors in the world that is given to a nurse. Dr. Newland is a clinical professor at New York University Rory Meyers College of Nursing and a nurse practitioner in primary care at a NYU Langone Health clinic. She is a Fulbright Specialist and will return to Lithuania in spring 2018 to help faculty continue to develop the advanced nursing practice program there. She has published extensively and is the editor-in-chief of The Nurse Practitioner, a highly respected peer reviewed clinical journal for nurse practitioners. Dr. Newland also holds fellowships in the American Association of Nurse Practitioners, the National Academies of Practice, New York Academy of Medicine, and is a current member of the New York State Board of Nursing. She also serves on Gustavus’ National Nursing Advisory Board. She received her bachelor’s in nursing from Gustavus, master’s from Pace University, and PhD from the University of Pennsylvania.